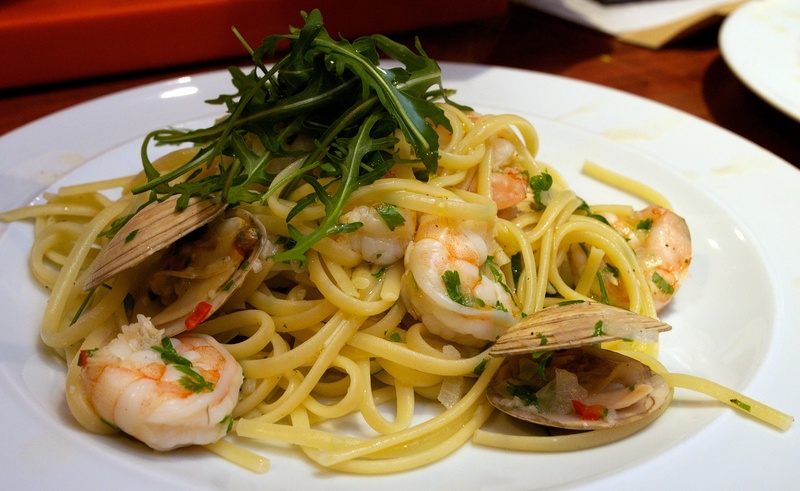 A fresh tasting seafood pasta dish. Wine Suggestion: We’re not huge fans of Prosecco generally as there’s an awful lot of very ordinary stuff being sold. 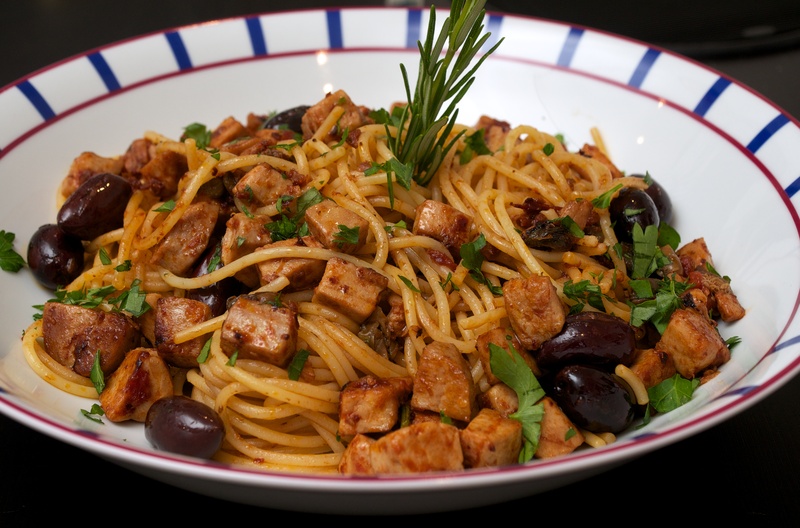 However, if you have a good one to hand, like the Nino Franco Rustico, then you’ve found your crab linguine match. Bring a large pot of salted water to the boil and cook the linguine for a minute less than indicated on the pack. Meanwhile, gently heat 3 tbsp of olive oil with the chilli and garlic in a large wide pan. Cook the chilli and garlic very gently until they start to sizzle, then turn up the heat and add the white wine. Simmer until the wine and olive oil come together. Then take off the heat and add the brown crabmeat, using a wooden spoon to mash it up to make a thick sauce. When the pasta is ready, turn off the heat. Place the crab sauce over a very low heat and use a pair of kitchen tongs to lift the pasta from the water into the sauce. Remove the pan from the the heat and add the white crabmeat and parsley to the pasta with a sprinkling of sea salt. Stir everything together, adding a drop of pasta water if needed to loosen. Taste for seasoning and add a small squeeze of lemon. Serve immediately drizzled with the remaining oil. Bring a large saucepan of water to the boil and add salt. Add the pasta and cook until al dente. Meanwhile, put the tuna into a large bowl and break gently into flakes. Add the capers, olives, lemon zest, Parmesan, parsley and chilli flakes and stir slightly. Reserve a ladleful of the pasta cooking water, then drain the pasta. Add the pasta to the bowl and drizzle over the olive oil. Add about 100ml of the cooking water and mix to combine. Season with salt & pepper, then serve immediately, sprinkled with extra parsley and cheese. Sometimes the simplest of ideas turn out the best. Wine Suggestion: we had a glass of the Adi Badenhorst Secateurs Chenin Blanc which he’s now experimenting with a little bit of skin contact. We don’t disagree, it adds a touch of extra texture and complexity to such a great value wine. Put a large pan of water on to boil, add loads of salt and cook the pasta according to the time suggested on the packet. Put the lemon juice, olive oil and Parmesan into a large warmed bowl and beat with a small whisk to combine and thicken. Tear the basil leaves into the bowl and add plenty of black pepper. Drain the pasta and toss with the mixture in the bowl. We’ve made this recipe before using good-quality tinned tuna, which was delicious, but this time we’ve used fresh tuna and it really sings. Wine Suggestion: Classic Italian matches for tuna depend on the region. If you are in Sicily a great match is their native Grillo grape, a textural, slightly salty and mineral wine with good body but not weighty. For this dish though we drank a Vermentino, made by Morisfarms, from the Tuscan coast. It has a great vinous texture and savoury character which combined with fresh fruit and minerality matches this Tuscan combination of tuna, tomatoes and olives. Drain the tinned tomatoes and cut into strips. Cut the tuna into 2cm cubes. Heat the oil in a pan and sauté with 1 sprig of rosemary and the chilli flakes. Add the wine and simmer until it evaporates, then add the capers. Add the olives and tomatoes and cook over a high heat for 15 minutes. 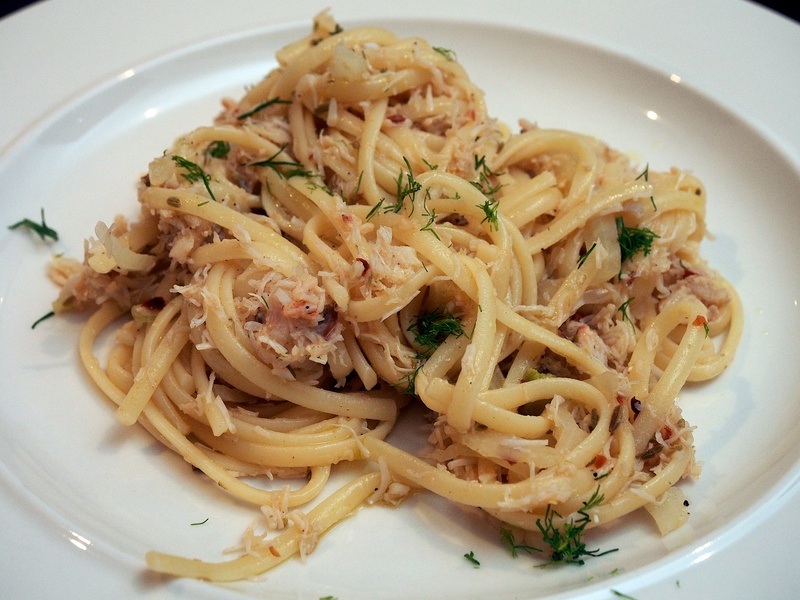 Cook the linguine until al dente, then drain and add to the pan of tuna sauce. Toss gently. Sprinkle on the parsley, drizzle with some more olive oil, and garnish with the remaining rosemary. We recently got a new cookbook by Lorraine Pascale and have been impressed by the recipes so far. This one we made for Valentines Day, just the two of us with a bottle of vintage Champagne from the cellar. A very nice evening. Cook the pasta according to the packet until al dente. Meanwhile, heat the oil in a large saucepan, with a tight-fitting lid, over a medium heat. Add the shallots and sweat for about 10 minutes or until softened. Add the garlic and chilli and cook for another couple of minutes. Add the prawns and cook for 1 minutes, stirring. Then add the clams and white wine, bring to the boil and cover with the lid. Cook for 4-5 minutes or until all the clam shells have opened (discard any that don’t) and the prawns have turned pink. Drain the pasta well and tip onto the cooked shellfish and toss together. Add the chopped parsley and season. Pile into bowls, drizzle with your best extra-virgin olive oil, scatter with rocket and serve with a lemon wedge. Crab with fennel & chilli is a winning combination. Another perfect pasta dish by Ruth & Rose of the River Café. Wine Suggestion: We find a great match for crab is a top quality Garganega and we highly recommend the Pra Soave “Staforte” which is made from low-yielding, 100% Garganega, old vines. Utterly pure and delicious. Remove the tough outer part and stem from the fennel. Slice the bulb across the grain very finely (use a mandolin if you have one). Reserve the green tops. Heat 2 tbsp oil in a heavy-based pan, add the garlic, fennel seeds, and chilli and cook to soften. Add the crab, lemon zest, and juice, then season. Stir just to heat the crab through. Cook the linguine in boiling water for 5 minutes, then add the fennel slices and cook together until al dente. Reserve a little of the cooking water when you drain the pasta. Add the drained pasta to the crab mixture and toss together until well combined. You can add a little of the reserved cooking water at this stage to loosen if necessary.